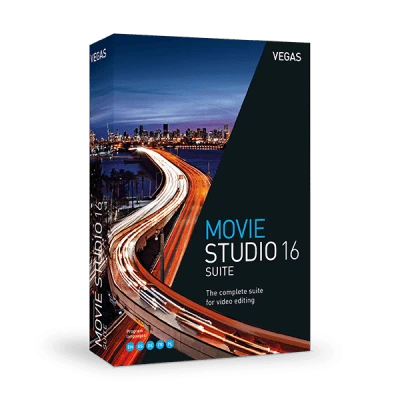 VEGAS Movie Studio 16 Video editing made easy, fast and fun. Let’s make a movie! 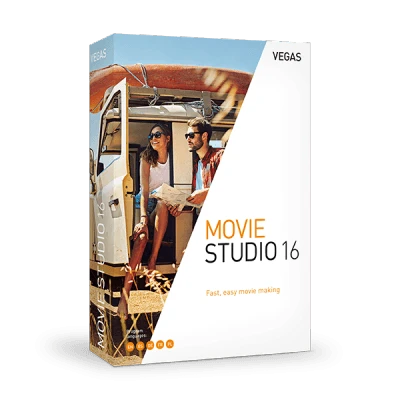 Create your videos while VEGAS Movie Studio 16 guides you from start to finish. Arrange your clips, add music and a title, then finish and deliver, all in a guided workflow - always with the option to take full control in your timeline. Move between specialized user interfaces to import files, add graphics, apply effects, add transitions, and finish your movie. Or switch to Power User mode for complete access to all of your tools. Assemble your videos quickly and intuitively with a storyboard. Lay out, trim, and rearrange your clips in the storyboard, and watch as the additions and changes you make are updated on the Main Timeline automatically. A great way for rough cutting and fast edits. Scrub through your video thumbnails right down to exact frames, and find the important parts of your video before you add it to the project. Simply move the cursor over the thumbnail to find any frame. Set in and out points for any of your media files before you add them to your project. Add the file to your project, and the timeline automatically trims the event to the in/out points you set. You can still re-trim to the full length of the media file on the timeline. Resize thumbnails to see more detail and hover scrub to exact frames more easily. A larger thumbnail means you can scrub and pinpoint specific frames more precisely to accurately mark in and out points. Select multiple clips in Project Media and preview each in sequence with a single play. Combine with the storyboard and in/out points for a fast, powerful way to make and preview a rough edit even before you work in the timeline. Now, every edit you make is saved automatically, so you never lose work if something goes wrong. If you’ve ever felt the frustration of accidentally stopping a long render that’s almost finished, worry no more. Enjoy the extra protection of confirming that you want to cancel. A cool new safety feature – VEGAS Movie Studio 16 warns you if the track you’re about to delete contains any media. No more accidentally deleting clips from your project – know for sure that you’re safe! Your project in one convenient location. Whether you use a tape- or file-based video camera, you can easily move the footage you've shot from the tape or card to your computer hard drive and into your project. 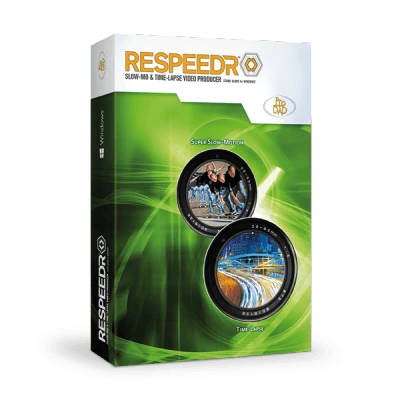 Import, edit, and deliver in Standard Definition, High Definition, or beautiful Ultra High Definition. VEGAS Movie Studio enables you to edit the files natively. No re-rendering or re-wrapping. VEGAS Movie Studio makes it easy to frame-accurately select the portion of the video you want to keep and crop out the rest. Six different precision editing tools make it easy to get exactly what you want for your final video. All of your timeline clip events are selectable from the current cursor position to the end of the project, either on individual tracks or on all tracks. Speed up your workflow by quickly creating space to insert other events into a project. In order to clean up your project, you can now quickly and easily close any gaps between events on a single track or all tracks in a project. This will quickly remove all black frames between edits. Introducing true motion tracking in the new Bézier Mask FX! No more manual keyframing of your masks – isolate, follow, and apply FX to moving objects in any scene, with keyframes generated automatically, in seconds. Take your FX to the pro level! 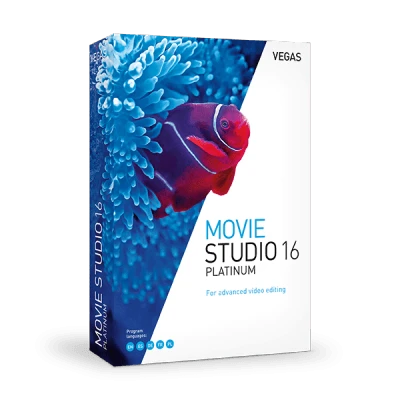 The new video stabilization engine in VEGAS Movie Studio 16 quickly stabilizes wobbly footage and gives you smooth, professional video with just a click. Easy and powerful – salvage footage you thought was unusable. Work right in the Preview window to quickly add and customize Bézier masks in an easy interface. Follow objects with powerful motion tracking, and pin other objects or text to move right along with them. Make immersive, interactive video environments quickly and efficiently. Stitch together dual-fisheye or multi-camera 360° views with ease, preview your video in 360°, and export directly to YouTube or other 360° video services – VEGAS Movie Studio 16 makes it simple. The Primary Color Corrector plug-in gives you complete control over your video's shadows, mid tones, and highlights to adjust colors, saturation, and gain. The Secondary Color Corrector lets you zero in on and tweak one particular color while you leave other colors unchanged. Switch between four different camera angles, in real time, with a click of your mouse to create compelling multicam productions. Just click one of the camera streams in the Preview window to select the shot you want, as the files play back simultaneously. With just a few clicks you can instantly add creative color treatments that take your viewers into a new realm. Create a new atmosphere. Emulate the feel and look of famous films, movie genres, film stocks or particular movie-making eras to help establish the mood and emotion of your movie. The Freeze Frame tool lets you set a custom default length for your freeze frames so you don't have to adjust it each time you create a new one. Hold that still frame for any length, and then restart the action from right where you left off when you're ready. VEGAS Movie Studio now has unlimited tracks to make it easy to organize complex projects. Spread your video and audio files across as many tracks as you need in order to keep everything logically arranged and easy to find. Create DVDs and Blu-ray discs with play buttons, menu navigation controls, surround sound audio, and Hollywood-style titles. Select from over 100 templates and add chapter markers. Preview and test all your movies and controls before you burn your disc. Choose from a huge array of great pro-level animated transitions to give your videos a funky, slick, or hip vibe. Add more punch and visual excitement to your work with only a few clicks. Choose your interval, save in your project folder or any other location, and then return and open your previous backups at any time. With this feature, you’ll be able to see the exact length of your timeline clip events displayed right on them. Not only that, you can change the display value to instantly adjust the length of the event with frame accuracy. This button tells you when the media in a timeline event has FX added, and lets you access and edit the Media FX directly from the timeline – even if multiple events use the same media. Sometimes the perfect edit means moving a group of events all at once. But sometimes you need to move only one or two and leave the others. Now you can temporarily ignore event grouping instantly to make your edit, while the events stay permanently grouped. A simple way to instantly add back audio or video of a clip to the timeline. No need to hunt for the clip: add it manually, and trim to fit – VEGAS Movie Studio does it all for you with a click. With real-time controls directly on the Video Preview window, you can create picture-in-picture effects on entire tracks or individual timeline clip events. Move the inset picture where you want it and resize it for the perfect presentation. Support for the latest generation of AMD and NVIDIA graphic cards and advanced Intel QSV (Quick Sync Video) technology boost real-time playback and drastically reduces render times for HEVC and AVC files. Customizable effects and features – from simple text to 3D animations. Create sleek, stunning graphics and titles quickly and easily from a large selection of templates, or from scratch with robust new tools and controls. Remove any colored background quickly with Chroma Key Pro, and replace it with a new background of your choice. Achieve pro-level FX shots with a huge degree of control and precision, with intuitive, easy-to-use tools, and an array of presets! Have your videos spring right out of a cartoon or a comic book, or combine the effect of “drawn” edges or paint-like colors with live-action footage, where ‘toons' and people are in the same world – unlock your creativity and let it soar! Create eye-popping 3D animated and textured titles for stunning, bold creative videos. Choose from 17 popular, fully customizable presets and take advantage of powerful motion graphics to lift your videos to new cinematic heights. Overlay professional-quality graphics, pro-level text, lower thirds, custom name plates, and more with ease. Let your videos rise above the rest, especially when combined with Chroma Key Pro, the other NewBlue add-ons, or VEGAS Movie Studio’s own FX tools. Perfect your colors. Selectively sharpen details. Touch up wrinkles on skin. Use an array of guides for perfect composition. Use edge smoother for professional text and graphics. The product names mentioned may be registered trademarks of their respective owners.